Have any "under the radar" type regional recipes you can share? I'll start: Hessian 'Tater soup. Maybe not very exciting, but I just love the stuff. Start off with a diced onion and about 1 - 1.5 kg of peeled, sliced potatoes. Throw into a big pot on high heat with some oil and let it develop some color. Meanwhile, get peeling and chopping on this stuff - carrots, celery root, leek, parsley, parsley root. Amounts as desired, but I like to use a lot of parsley - root or leafs. If your taters get enough color, cover with water and add the rest of the veggies. All that in place, cook until soft. Blend. Add 200ml of sour cream and season with nutmeg, pepper and salt. Consistency should be thick, maybe slightly chunky. When serving, fry up a few slices of old sausage to throw in there. This one is a traditional north hessian sausage, but any only lightly spiced and smoked, coarse ground, fatty hard sausage will do. Add a sprig of parsley if you feel like upping the presentation. That sounds great, and easy to make with the shops near me. Going to try that out! I’ve made something similar but added smoked fish to it. For a low key recipe, I like imitation bimbimbap. Make some rice, at the end, throw in canned tuna, fried eggs, spam, assorted vegetables (cooked if you like) and some gochuchang, sesame oil (maybe sugar if wanted), stir well. A quick to make one-pot meal. I don't think Brazilian food is appreciated enough worldwide, probably because it is not common to find well made Brazilian food outside of the country. Some ingredients are also hard to come across. Our cuisine is extremely diverse with many influences, mainly African, Portuguese and native-Brazilian, but also Italian, German and Mediterranean. A lot of our traditional recipes came out of necessity, and are appreciated both in a practical day-to-day fashion, and in a more full-featured "fancy" version. For example: a full-blown feijoada is something you make on special occasions, but on the day-to-day we eat a version with less ingredients. Feijoada: beans cooked with an assortment of meats. Usually accompanied by rice, farofa de mandioca (a gift from our Native heritage, it's the toasted version of farinha de mandioca, a kind of rough flour that enhances the flavour and texture of the plate), Brazilian pepper, couve, and, on Rio de Janeiro, oranges. It's similar to the cassoulet. The feijoada is made with meat cuts that were once cheap and considered inferior, but because of feijoada they became more expensive with time. Some people believe it was invented by slaves, in order to make use of the inferior meats their patrons gave them. The veracity of this story is disputed. Feijão tropeiro: it means "cowboy beans". The cowboys came up with it as a food that was easy to conserve and transport on long travels. 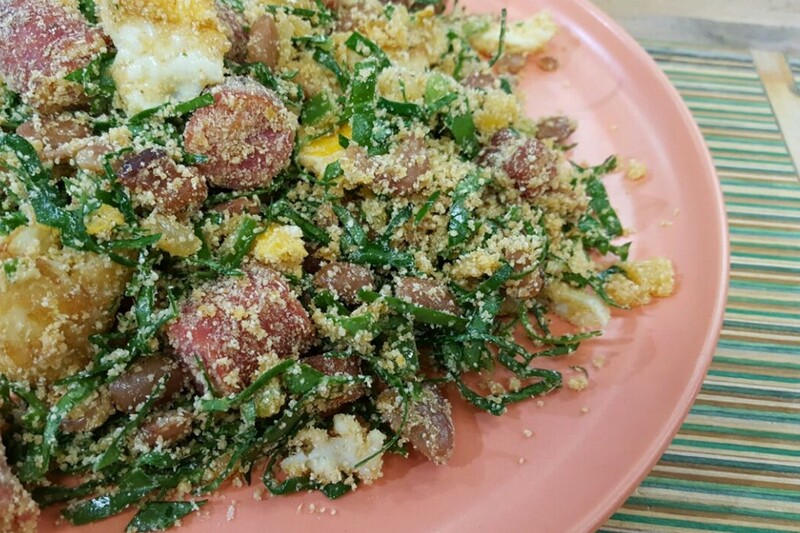 It's also quick to prepare on the outdoors: just fry some bacon, linguiça and whatever salted meat you have, cook some beans, fry some farinha de mandioca (so it becomes farofa) and mix everything. Simple, cheap and delicious. Moqueca: a kind of stew, usually of seafood slow cooked in palm oil, which gives a very strong flavour that basically takes over of all parts of your mouth in a moment of pure pleasure :). Like all foods that uses palm oil, it is quit heavy and not meant to be eaten regularly. Common ones are made with shrimp, dourado and beijupirá. There's a version of moqueca without palm oil, but I won't dignify it with a description. Acarajé e abará: a dough made of smashed black-eyed peas. When fried on palm oil, it becomes the acarajé. 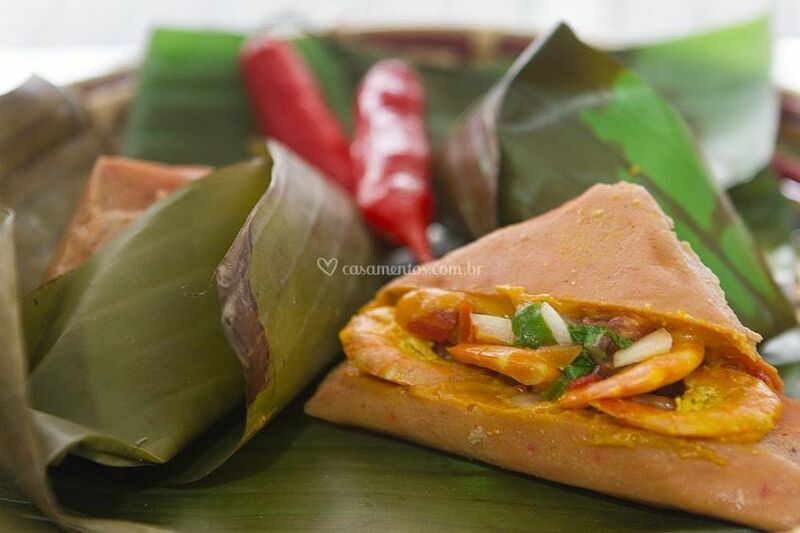 When you add palm oil to the dough an cooks it in banana tree leaves, it is called abará. They're both highly sought treats across the country, and I happen to live in the most African city of Brazil, which has the best acarajés and abarás in the country :). It's really hard to digest, though, and it's not rare for tourists to feel sick after the first time they eat those. But they always come back for more! Acarajé and abará are actually "comida de santo" ("holy foods"), meaning they have ceremonial significance in the African-Braziliian religion called Canbomblé. Besides that, much like the US, we have many Italian, Japanese and Chinese immigrants, that adapted their cuisine to the local taste in various, delicious ways. But if there's something that unify us it's beans and rice. We all eat beans and rice. I'll contribute two, although I can't really recommend these as summer is approaching however they're near and dear to my heart. Frico and polenta I would say are the ultimate underrated comfort food, easy to make and based on what should be leftover food. Serve this up with some salsiccia and it's absolutely heavenly. Both links are to frico, fyi. Thanks for the contribution. Yeah my bad, I think I forgot to copy and paste the second link.